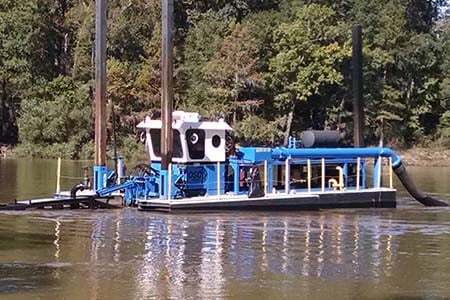 Dredging | Carter Dredging II, Inc. Dredging | Carter Dredging II, Inc.
Dredging | Carter Dredging II, Inc. Removing sediments and deposits from channels, harbors, and River basins. Dredging is an excavation activity usually carried out underwater, in shallow seas or freshwater areas with the purpose of gathering up bottom sediments and disposing of them at a different location. This technique is often used to keep waterways navigable. We listen, we discuss, we advise. It sounds simple, but in practice it is a far more valuable trait to possess than just being able to perform the job. We do more than perform a job; we do the job right. With 46 years of experience in dredging and excavating processes, you can rest assured that we are going to get the job done right because we have knowledge of the tools we provide and the services we offer to our clients.